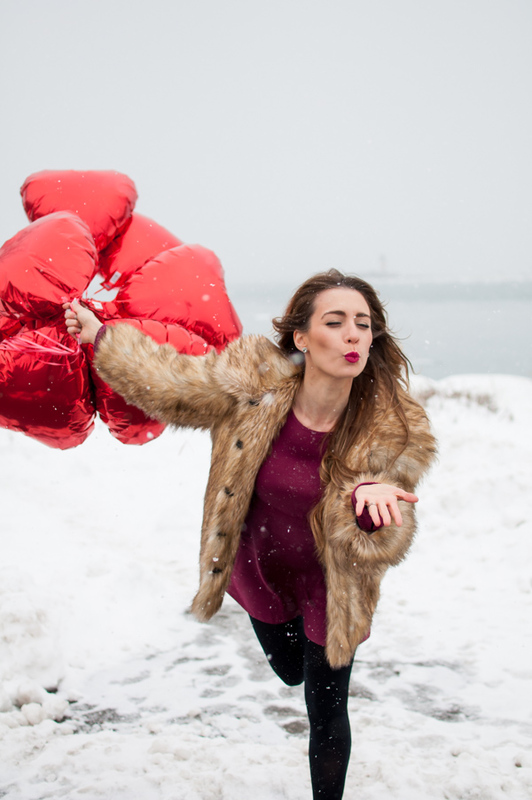 OOTD - Valentine's Day Faux Fur | La Petite Noob | A Toronto-Based Fashion and Lifestyle Blog. I hope that everyone had a fantastic Valentines Day weekend! Even though I had a great weekend, it was not without it's tribulations - it's been COLD here in Toronto! I'm talking -40 degrees Celsius cold, which is no joke. We were still able to be out and about this long weekend, but it just meant making the extra effort to stay warm. This outfit in particular is what I wore for Valentines Day, after it being altered slightly for the extreme temperatures. For example instead of sheer hose, pumps and a light jacket I opted for heavy tights, booties and faux fur. 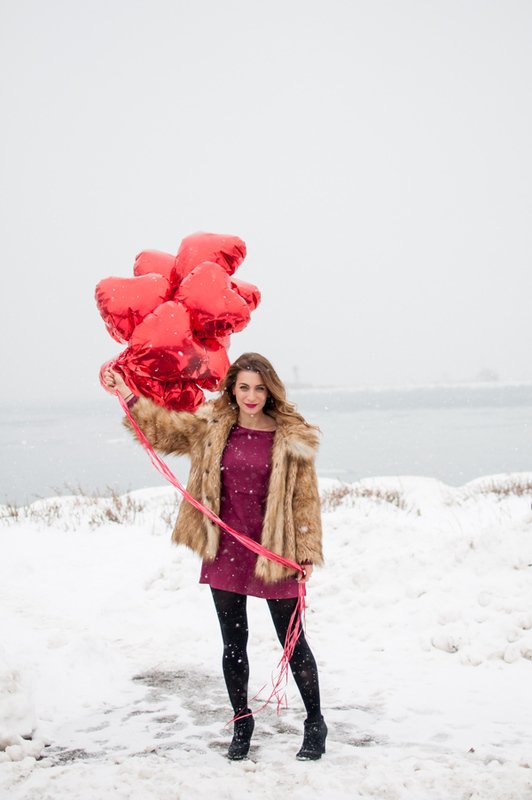 Mother Nature was not going to stop me from my plans - or from an impromptu photo shoot with an oxblood dress and fun heart-shaped balloons! If you follow me on Instagram, you would have seen some snaps from my Valentines Day adventures. We started off the day with brunch at the incredible Cluny in the distillery district in Toronto. I really enjoyed my eggs Benedict, and even treated myself to a pre-noon cocktail - because why not! After a few lattes with friends at my favourite coffee bar in the city, Dineen Coffee Company, we moseyed over to the Art Gallery of Ontario to check out the new Jean-Michele Basquiat exhibit - incredible. Finally we ended the day binge watching my new favourite show 'The Wire.' All in all, I couldn't have asked for a better day and have gone from a Valentines Day hater to secretly wishing that everyday was Love Day! How was your Valentines Day? Let me know! This is adorable! I feel your pain, we're in the middle of a winter storm right now. Through in general I think North Carolina winters are much more tolerable than in Toronto! We had a nice evening in for Valentine's. I'm glad that you had a nice Valentine's day! Yes, NC is probably milder than Toronto but Winter is Winter and it's hard everywhere! Bring us Spring! It's been so cold, I can't believe you braved the temperature to shoot outside, but the results are amazing! I spent v. day with friends, donuts and Julia Stiles movies...the dream! And that fur coat, woah <3 ! I still can't believe I took these photos outside - or that my "photographer" agreed to go along with it! LOL. Sounds like my kind of night, I love a good Julia Stiles movie - especially 10 Thing I Hate About You! Thanks Jessica, I'm glad that you like them! I always have to psych myself up so much to go outside and take photos, but I'm always happy that I did! these are super cute photos! So cute!! I'm jealous about your weather! It hasn't been cold enough to pull out the fur this year. Not cold enough to put on fur - I'm jealous of YOUR weather lol! Trade? So pretty! These balloons make the photos so fun. Thanks Emma, I had a lot of fun shooting photos with them!